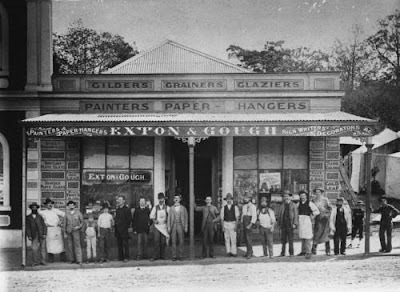 The expansion of Brisbane from penal outpost to growing colony and finally state did wonders for many of the early tradesmen - the stonemasons, the architects, the builders and painters. Robert Exton was a painter who worked in Brisbane from 1882 through to the 1920s. Originally he was in a partnership with George Gough, and here are their Petrie Bight premises photographed in 1884. Exton & Gough were involved in some significant projects, such as the Treasury Building, Customs House and the Smellie & Co warehouse. They also provided stained glass windows for both St Stephen's Cathedral in Elizabeth St, and St Patrick's Catholic Church in the Valley. The partnership dissolved in 1907, and Exton struck out on his own as RS Exton & Co. and built this Ann St building, designed by Claude Chambers, in the same year. The building was situated next to the J Simmonds Monumental Works, which was in turn next to St Andrew's Presbyterian Church. RS Exton & Co continued as painters and decorators, but it was to be stained glass windows (particularly ecclesiastical) for which they were to become really well-known. The buildings on Ann St began to change too, and Shell House and the Masonic Temple were built between St Andrew's Presbyterian Church and Exton's building. After Robert Exton died in 1921, the business slowly declined through to WWII. The original facade of the building is all that remains (above).